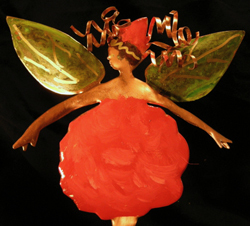 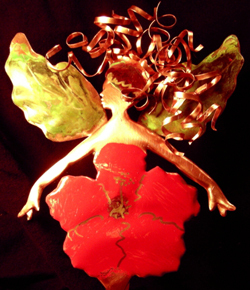 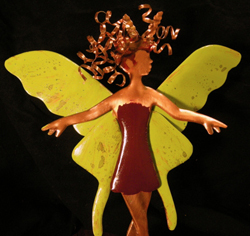 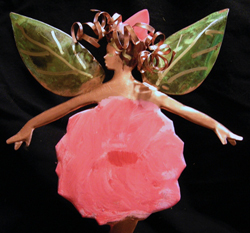 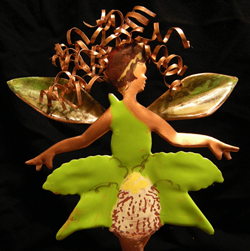 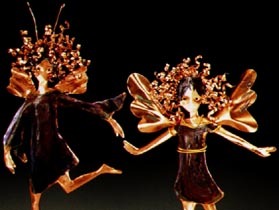 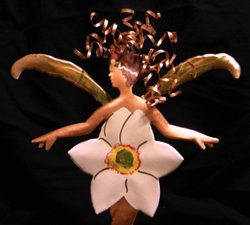 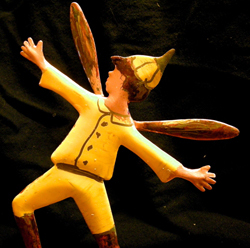 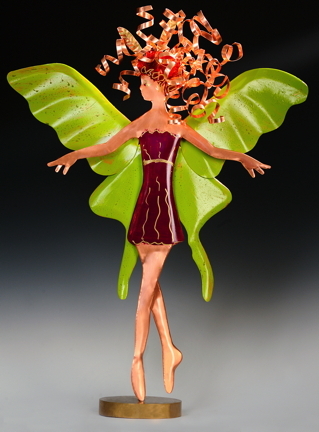 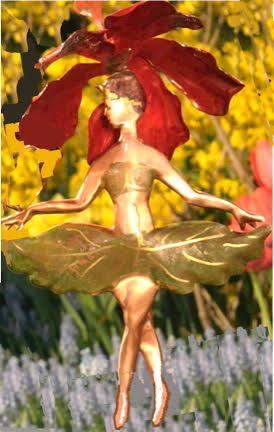 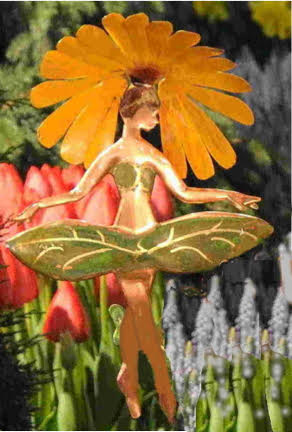 Each Tiny Flower Faerie is 10 inches tall and 4 to 6 inches wide The colors are either patinas or outdoor enamels. The 26 inch flexible copper wire can be bent to sit on a table or go on a wall, or it can go straight down in the ground. 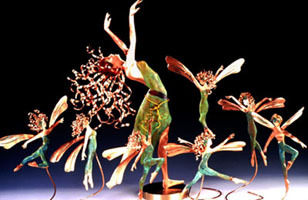 Each is $125. 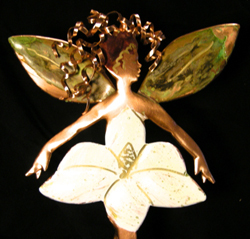 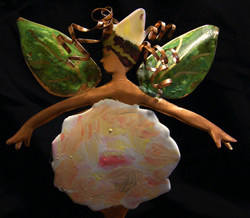 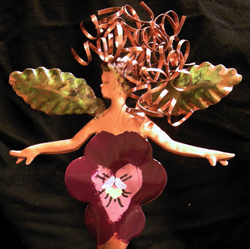 The Mother Nature and Flower Faeries Group is $950. 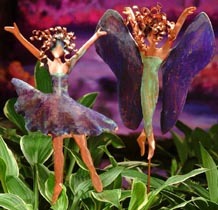 The two “Hat Faeries” are $155 each. 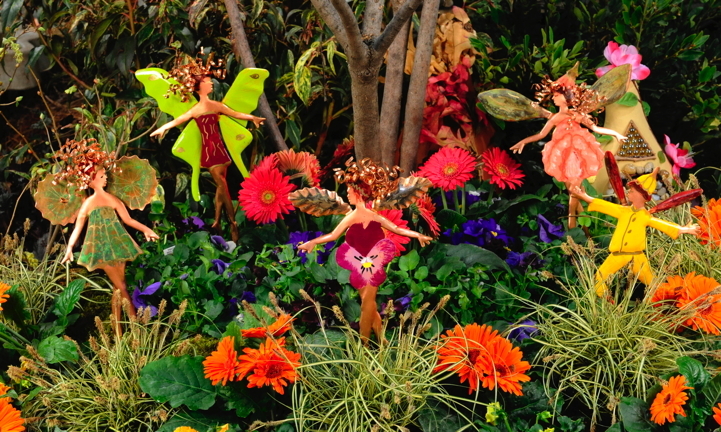 Each of these is $495, is approximately 31 inches tall and between 11 and 14 inches wide. 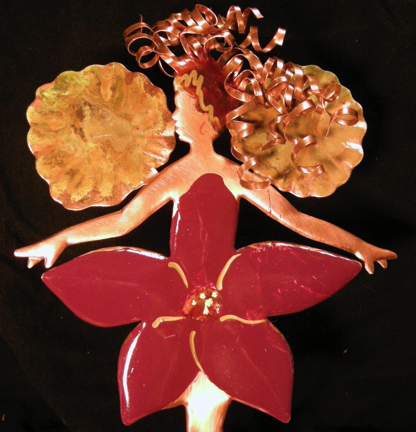 A 3 foot copper stake is included. 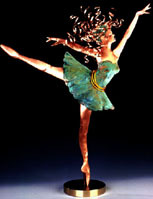 A bronze base is available for $125 and an iron base for $50. 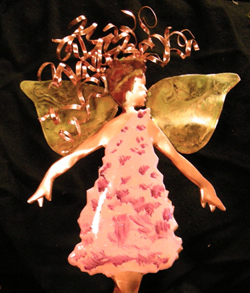 A 5 foot stake is available for $30. 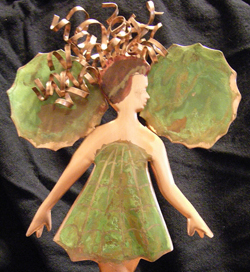 These are inspired by the four elements; the dresses and what they hold in their hands reflect the element. 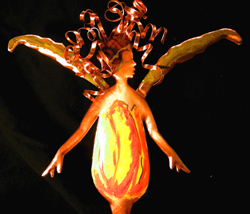 The Heavens is an alternate version of Air and Sun is an alternate version of Fire. 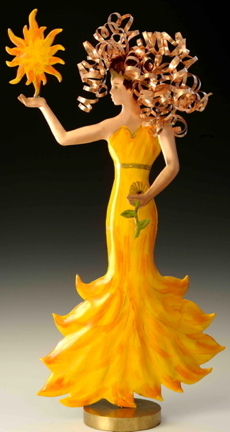 Fire also represents Passion; notice her hand on her heart. 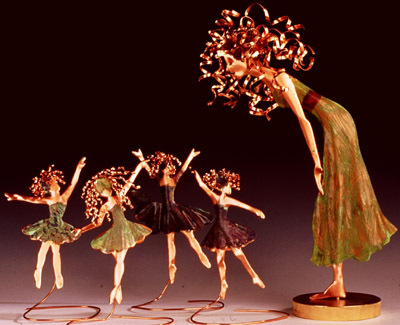 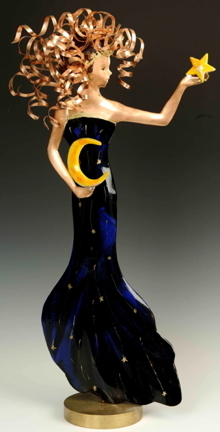 Each of these large sculptures is $450, is approximately 31 inches tall and between 9 and 13 inches wide. 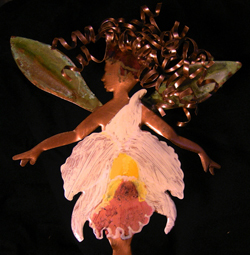 A 3 foot copper stake is included. 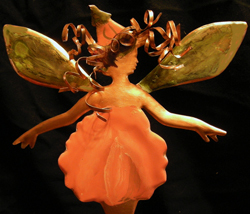 A bronze base is available for base for $125 and an iron base is available for $50. 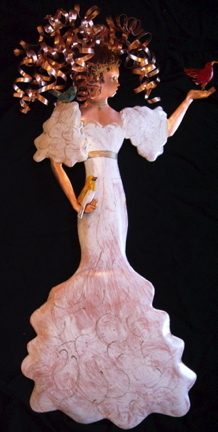 A 5 foot stake is available for $30. 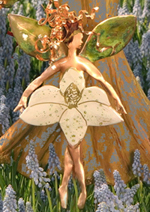 They are inspired by life-sized paintings of women representing the four seasons: they are based on images by Alphonse Mucha, the creator of Art Nouveau in Paris. 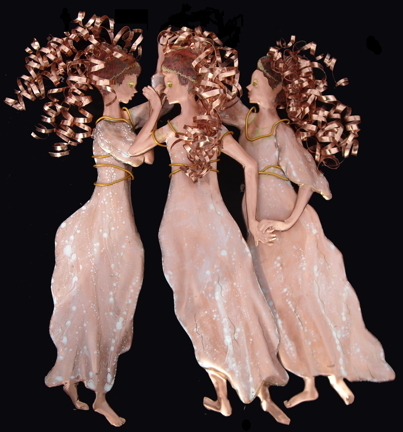 You can see images of the Mucha-inspired paintings and Brasserie Julien on Facebook at Copper Curls Sculpture. 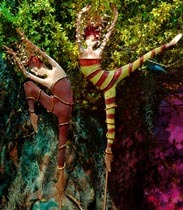 Each of these large sculptures includes a 3 foot garden stake. 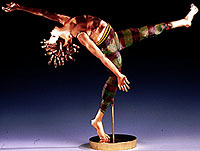 A bronze base is available for $125, an iron base for $50, and a 5-foot garden stake for $30. 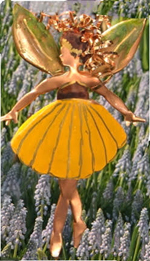 Double click on the image to see the exact size. 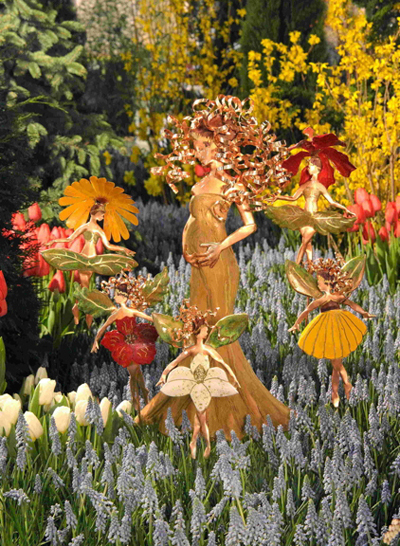 The Van Gogh is inspired by his self-portraits and paintings of sunflowers, the Little Girl, Dance at Bougival, and Girls with Baskets are inspired by Renoir paintings, and The Three Graces and Flora are inspired by Botticelli’s “Primavera." Each of these large sculptures includes a 3 foot garden stake. 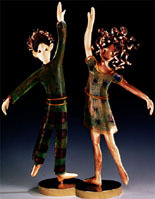 They are approximately 28 inches tall; size and price details can be seen by double clicking on the image. 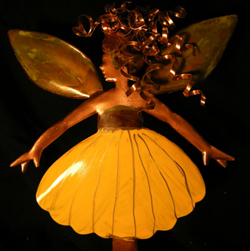 A bronze base is available for $125, an iron base for $50, and a 5-foot garden stake for $30. 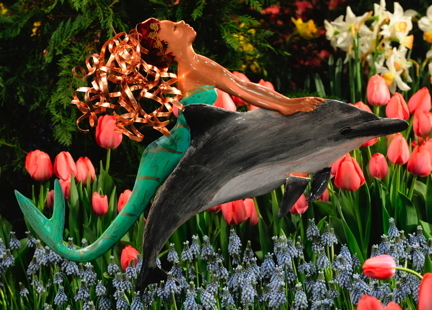 Double click on the image to see the exact size. 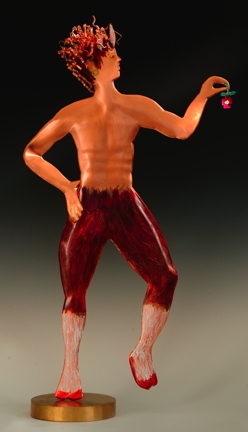 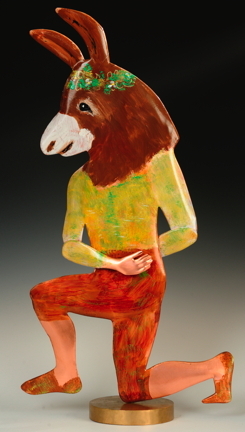 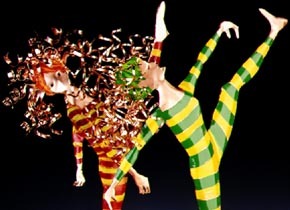 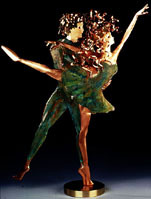 The sculptures are inspired by William Shakespeare’s magical play, "A Midsummer Night’s Dream"
Tango I (21.5x14)- $595 includes Bronze Base, $550 without base. 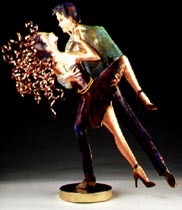 Tango II (22x15)- $595 includes Bronze Base, $550 without base. 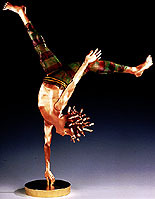 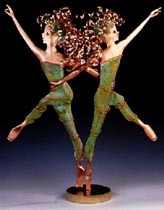 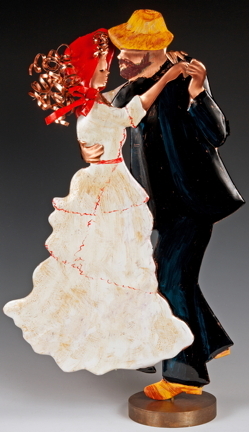 Tango III (22x15) - $595 includes Bronze Base, $550 without base. 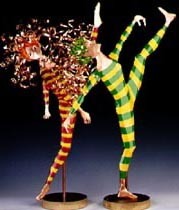 Sizes shown are not proportionate.